Over the past few months I have been trying out a number of Pinterest ideas. Some worked well, some were so-so, and some were not worth the time. Inspired by the Stuff You Missed In History Class series of Impossible Episodes, here are my Impossible Pins! Now if you are not familiar with that lovely dynamic duo of knowledge, go check them out immediately! The Impossible Episodes theme is where they take topics that are fascinating, but they do not have enough material to make a full episode out of. While these pins are fun, I really couldn’t write enough about them to warrant a full blog post. Now without further ado, my three impossible pins! The premise is simple, using bread clips you label your cords. 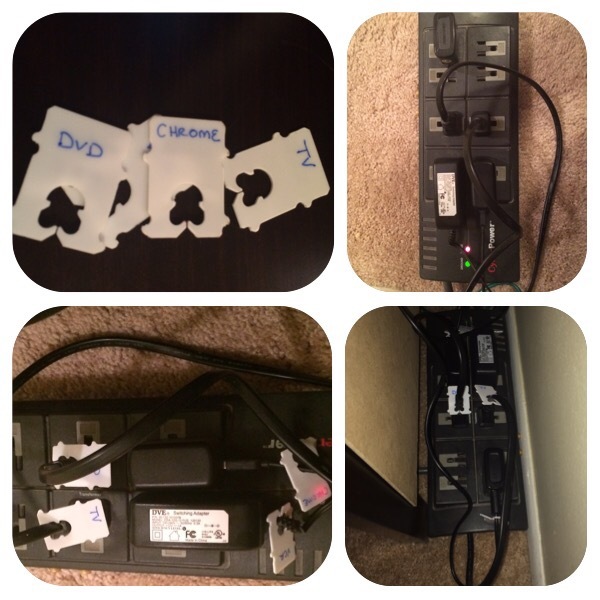 This is most useful when you have a power strip and lots of similar cords – like from the TV, DVD player, and Chromecast. While this doesn’t really make day to day things easier (I mean how often do you daily need to move power cords?) it was especially useful when I reorganized my living room. In a snap I knew which cords went to what device so I could move each one without unplugging all of them. I did my research for this one down to the kind of magnet and weight of the jars. I looked at multiple sources (all with photos of their own DIY) and still was not able to recreate this. I tried three different glues, and no matter what the glue was too weak to hold the magnets. When I took a jar down I would inevitably leave a magnet behind. After three failed attempts, I gave up and bought pre-made versions from Amazon (linked here if you are interested). They were cheaper than my DIY attempts to add insult to injury. Who hasn’t been frustrated when your cord breaks near the connection? I have had that happen to at least two phone chargers from the constant bending of plugging and unplugging. The idea of an easy, inexpensive, and quick solution was very appealing. Sadly it was not meant to be. 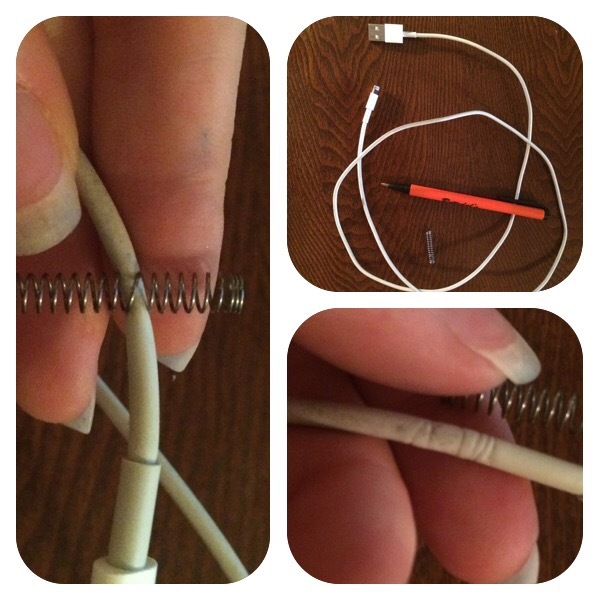 The idea is that you use the inner spring from a pen, wrap it around the cord, and help keep the cord from bending and breaking. All the pens in my possession (and I tried four different kinds) had spring that were too small to fit around the cord. Most of them were so small that they almost cut into the outer cover of the cord. So that is it folks. One win and two losses, I still call this an overall win on the Pinterest fishing expedition record!